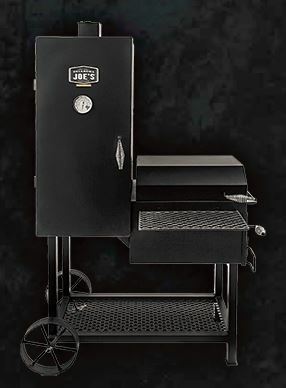 The Oklahoma Joe Smokers have been made by Char Broil since 1998 and have been getting beat up in the press as a classic, “They don’t make them like they used to!” story. 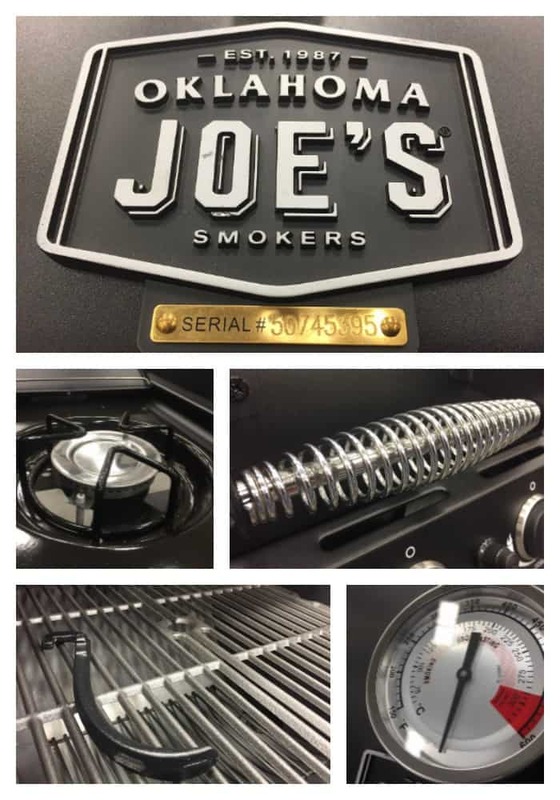 If you put the past where it belongs…in the past…and focus on the products that they are making today, then you will see that the Oklahoma Joe’s are probably the only offset smokers under $1,000 worth buying. There are six different smokers in the Oklahoma Joe line and they are pretty easy to review. Update 2019: There is a new addition to the product line. Learn about the Oklahoma Joe Bronco Drum Smoker! All of these smokers come with a two year warranty and perform better when you seal up the gaps with high temperature silicon and gaskets. When I first wrote this article I was pretty harsh on the Longhorn Combo Grill and advised folks to skip it completely. My logic was that the Longhorn Combo was a sub optimal smoker combined with a sub optimal propane grill and why would you want a combination of two sub optimal products. 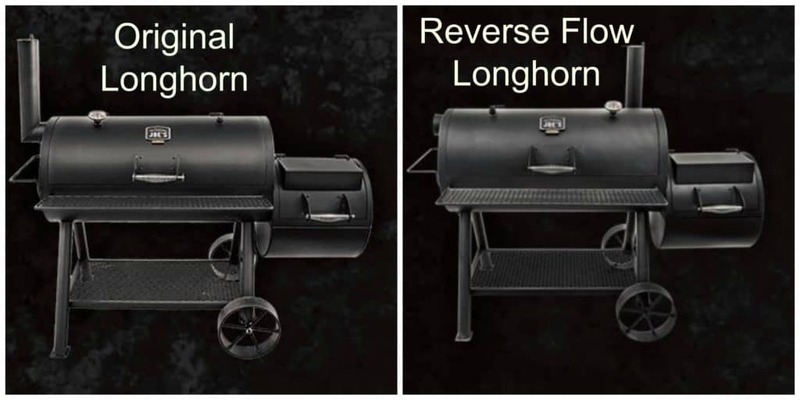 That being said, a lot of people are looking for a combination grill and smoker and, in my opinion, the Longhorn is the best smoker grill combo available. When I was researching this grill I bumped into a couple of owners that were raving fans who said this was the best grill they have ever owned. That surprised me. I went over to Lowes website and pulled up the owner reviews. The reviews are pretty solid. The negative reviews mainly dealt with excessive rust and the gas grill running too hot. I have to admit that the Longhorn Combo is an attractive grill. The dual over sized front badges, over sized thermometers and the chromed cool touch handles pair nicely with the jet black of the grill. The grill is a pleasure to look at. 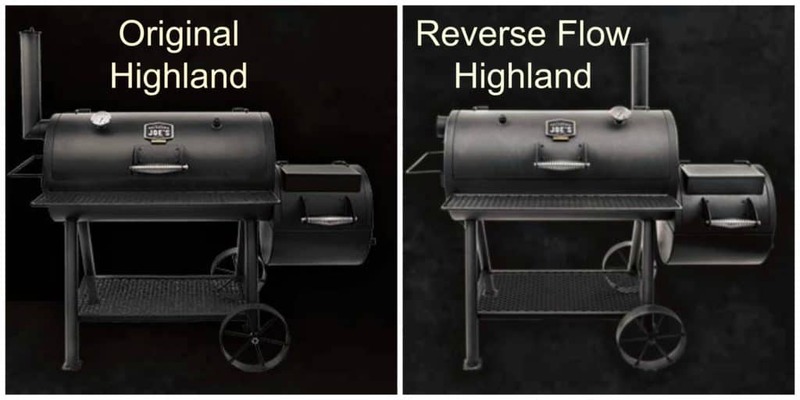 The Highland is a standard offset smoker that comes in two versions, the Original and the Reverse Flow. 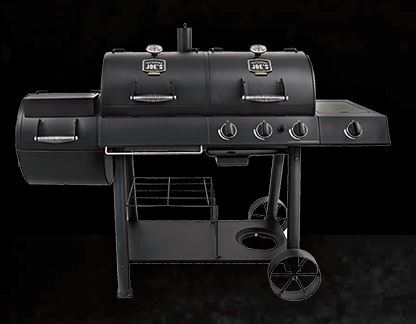 The difference between these two models is that the Reverse Flow version has four heat baffles that “reverse” the flow of heat throughout the smoker. The act of reversing the heat and smoke helps even out the hot spots in the smoker. On the Original smoker heat enters the cooking chamber from the fire box on the right side of the grill, rises in the cooking chamber, and exits out the stack on the LEFT side of the cooker. On the Reverse Flow smoker heat enters the cooking chamber from the fire box on the right side of the grill, circulates around the baffles and across the cooking surface and then exits out of the stack on the RIGHT side of the cooker. The Reverse Flow cooker is the better smoker but the baffle system increases the price by about $200. If you are feeling handy you can make your own baffle system and save a little cash. Check out this article as a great starting point for modifying one of these smokers. Here are the Lowes reviews for the Original Highland smoker. I think the title of the first review sums this smoker up perfectly. After you spend a little time making some modifications and sealing up the air gaps you will have a great smoker. The Longhorn is the Highlander’s bigger brother. Other than size and cost there really aren’t any notable differences between the Longhorn and Highlander. Please see above for the difference between an Original and Reverse Flow model. Here is a video walk through of the Longhorn Reverse Flow Smoker that lets you have an up close look at the baffle system. The Bandera is a vertical offset smoker and I love the look of this thing! I was able to put my hands on this guy and it was hard not to bring it home! The Bandera has three adjustable cooking trays in the vertical chamber along with an integrated water pan. What I really like about this smoker is the baffle between the firebox and cooking chamber. 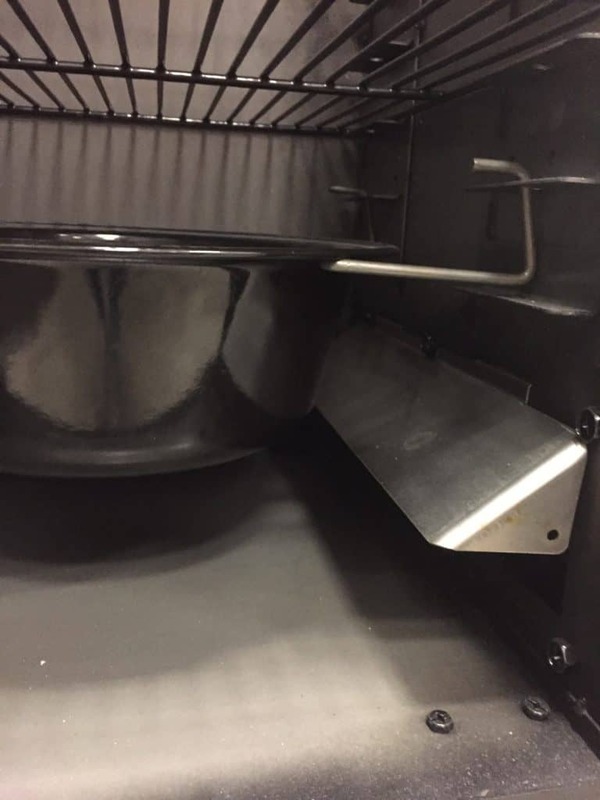 The baffle directs the heat downwards and directly against the water pan. This configuration makes sure the heat is evenly distributed and a moist cooking environment is maintained inside the chamber. Here is a nice video walk through of the Bandera. The Oklahoma Joe smoker brand started in 1987 when Joe Davidson sold a dozen smokers at the Oklahoma State Fair. Joe partnered with his brother Roger and they quickly their little company into a powerhouse with 150 employees making over 100,00 pits per year. In 1998 the Davidson’s sold their company to Char Broil. 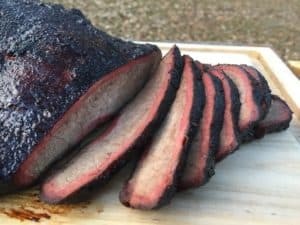 Roger Davidson was unable to stay away from the barbecue game and, in 2002, started making pits back in Oklahoma and selling them under the Horizon brand. Smokers are getting cheaper and cheaper in the us. I am not sure how they produce them so cheap. These pits for under $1000 are a bargain. I build smokers in Latin America and can’t compete with these on price. Competing on price is a hard game. I would rather compete on quality and focus on buyers with bigger budgets. 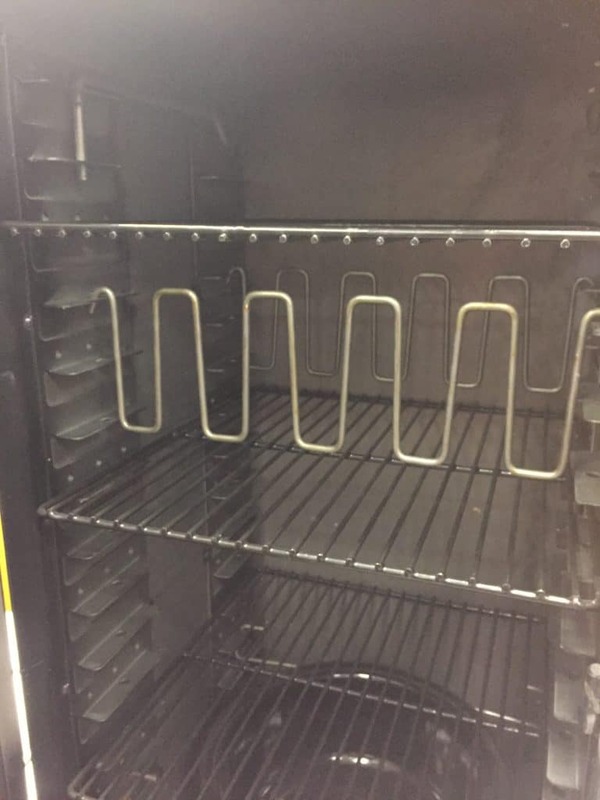 By the way…your smokers look beautiful!